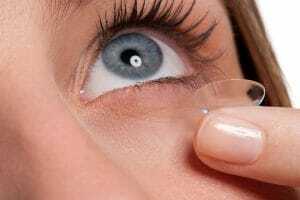 Contact Lenses | Frightened of Switching to Contacts? Frightened of Switching to Contacts? Did you know that over 36 million people in the United States wear contact lenses? Although this common method of correcting vision is prevalent throughout the U.S., some people are still afraid of switching to contacts. If you’re among those who are afraid of touching your eye, here are a few simple ways to conquer your fears this fall. Talk to an optometrist. No one knows contact lenses better than an optometrist! Even some of the most qualified specialists at Valley Eyecare Center were originally afraid of using contacts, but we have a few tricks to help you get over this fear. If you have specific concerns related to your condition, make sure to discuss them at your next appointment. Know the process. We suggest starting with the same eye each time so that it will eventually feel like second nature. With the contact lens in one index finger, use your free hand to hold your eyelid and insert the lens. Blink, and you’re done! It’s as simple as that. Look away. Do not look directly at the contact lens as you put it into your eye. Instead, look into the mirror so that you can take some of the emotion and closeness out of the process. Some myths aren’t true. Some people may be afraid of wearing contact lenses because they’ve heard a few myths about contacts. Rest easy knowing that your contacts cannot slide behind your eyes, and you will be able to take them out easily. They are designed to stay in and slip out easily when you remove them for the day. Wearing contact lenses can be far more convenient than wearing eyeglasses, so do not give up. Be patient, and keep trying! For more information on contact lenses, or to schedule an appointment with a specialist at Valley Eyecare Center, call (602) 955-2700, or visit our website.